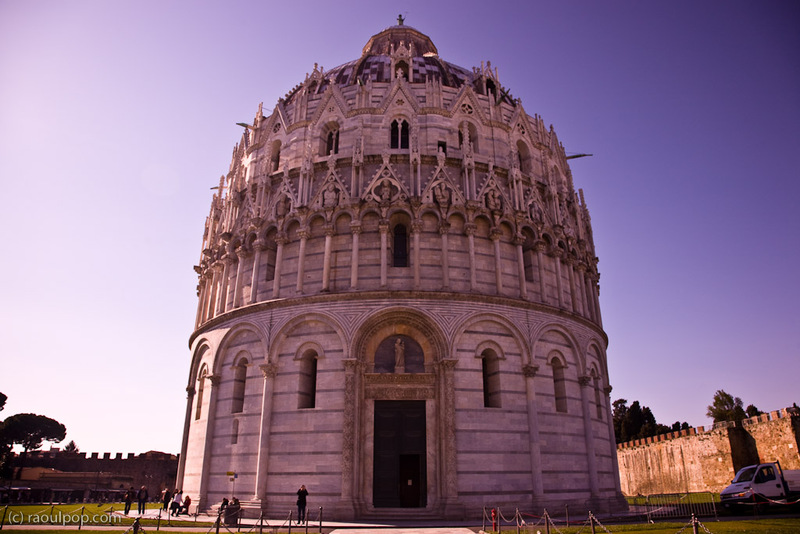 Our Italian road trip started in Pisa on February 18th. 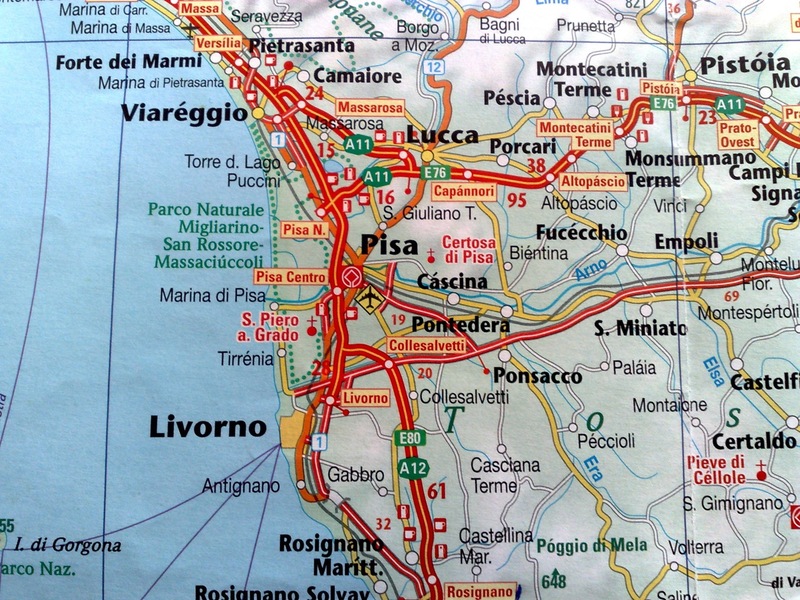 A map of Pisa and the surrounding region. We arrived at Pisa Airport via Ryanair around 11 am. 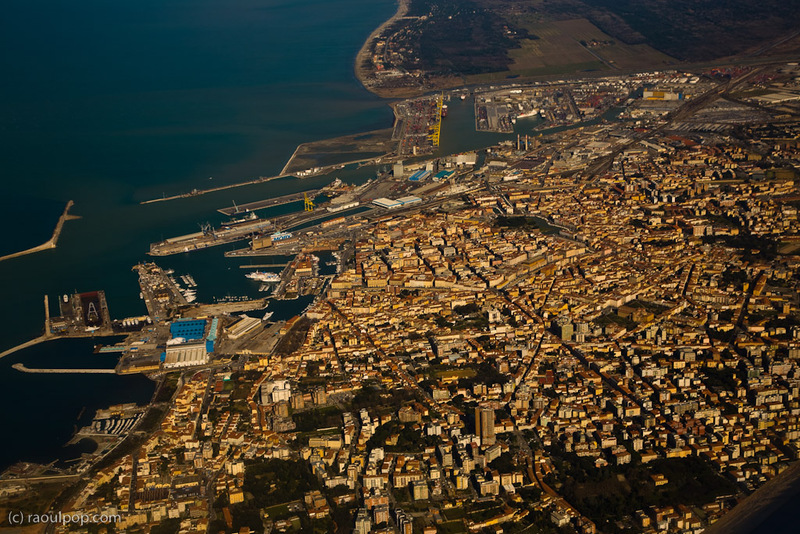 The airplane passed Pisa, then circled back over Livorno and landed. 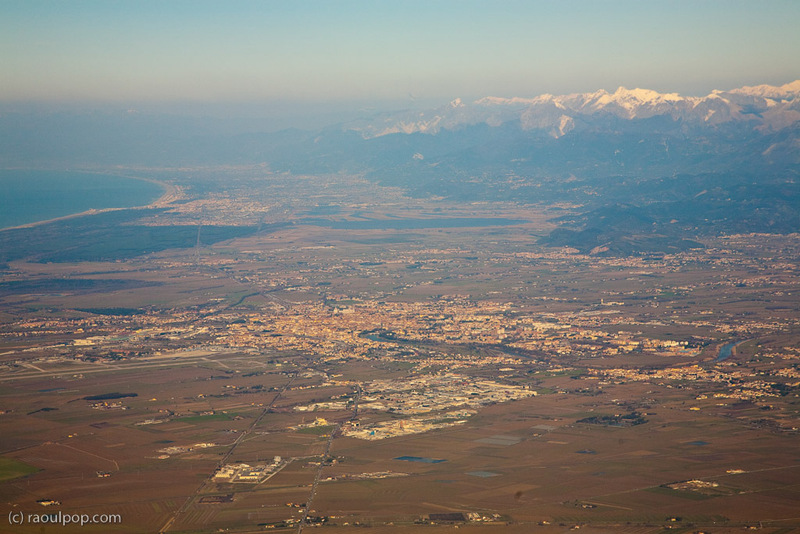 On a Ryanair flight above the city of Pisa, in Tuscany, Italy. The Mediterranean Sea is visible in the upper left. 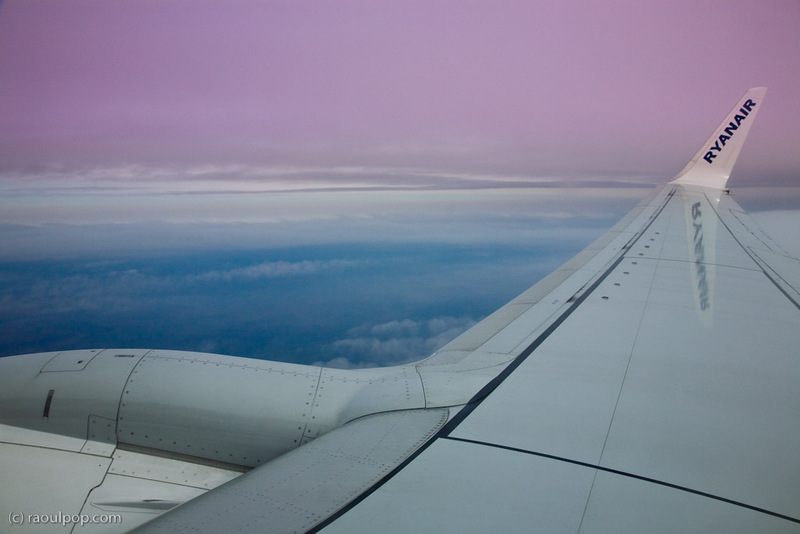 On a Ryanair flight above the city of Livorno, in Tuscany, Italy. It was around noon that we got our luggage and rental car sorted out and left. On our way out, we took a wrong turn and found ourselves in the industrial zone outside the city. As long as we were there, we stopped to have lunch. The food was good, but the prices were the same as in downtown restaurants. I don’t know about you, but if I’m going to pay the same price, I’d rather have my food in a nice place, not in a hole in the wall near a bunch of warehouses. We left after asking someone for directions, and were soon inside the city. We stopped at the intersection you see below to find our way around. 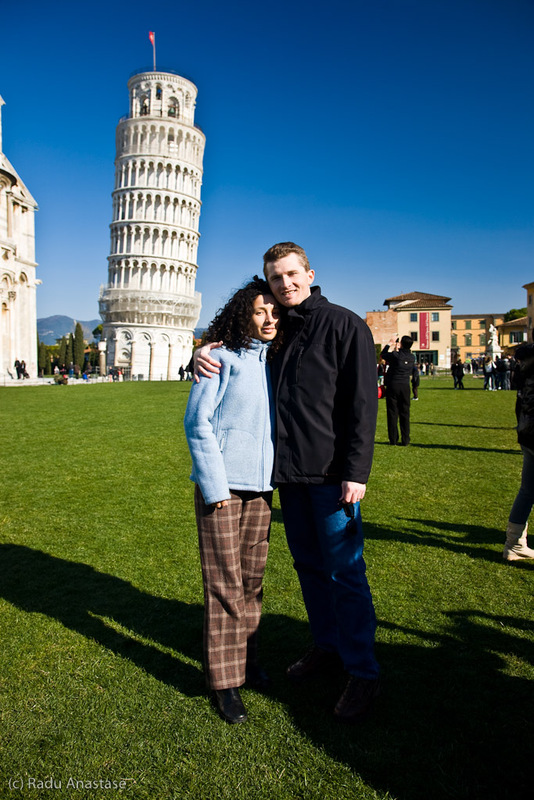 We needed to find the leaning tower, and thankfully, there were signs to guide us along the way. 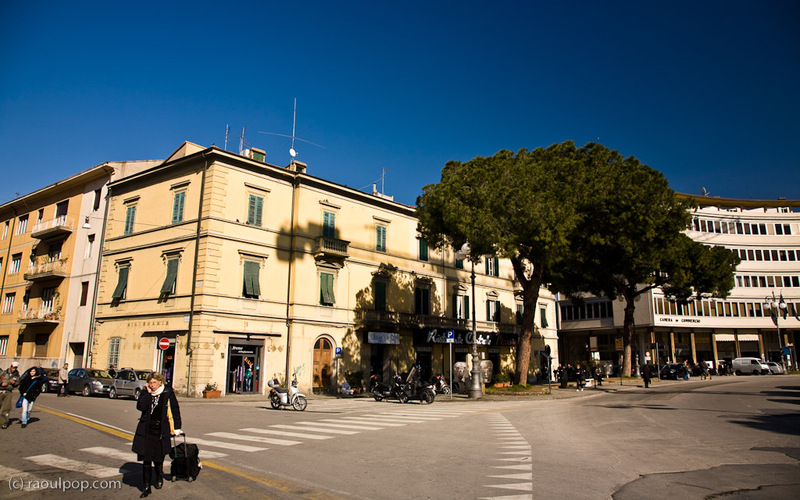 Once in the old town center, we found a nice area and decided to stop and visit for a while. We found the parking lot you see below, and parked there. We stopped here to visit the old town center. In this photo, you can see the same building visible in the lower right corner above, but from nearby. We parked our car a little ways down this street. The ZTL (Zona Traffico Limitato) sign, marked by a round red circle, can be seen here. 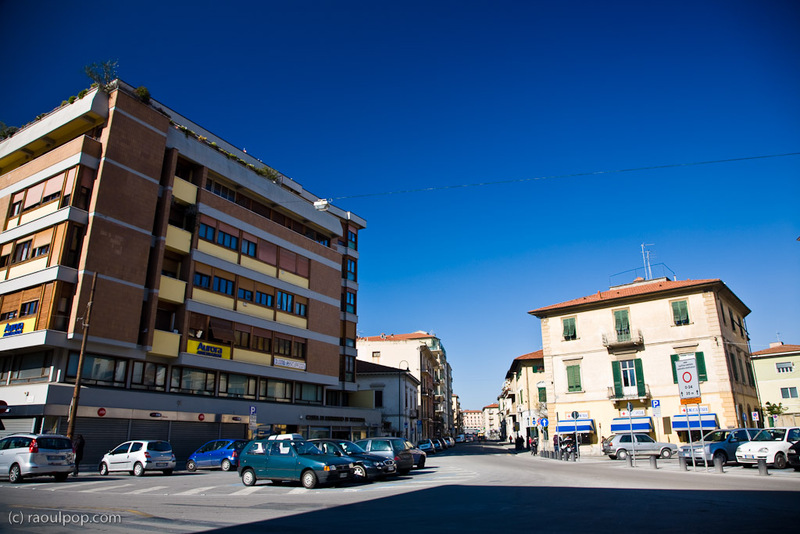 Make sure to obey these signs while you’re driving in Italy. They mark specific areas where traffic is limited during certain days and hours. You can incur hefty fines if you drive through one of these areas when you’re not supposed to do it. We found a parking spot on this street. We started to walk around, taking photos of interesting buildings and spots we saw. Nearby, there was this building with a cross on the roof. It appeared to be a church, but was unmarked and not open to the public. Not sure what this is, but I liked the facade. This building appears to have once been a villa for a wealthy family. 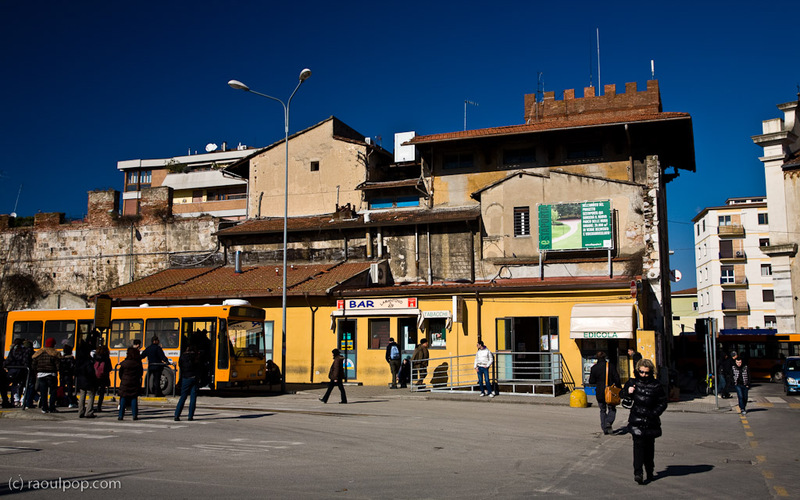 Now it’s been converted to a bus depot, called CPT Autoservizi Lazzi. There are ticket counters inside and behind it, there’s a large parking lot where people wait to board the buses. This is the back of the villa from the previous photo. As you can see, a few smaller buildings are huddled next to it, and what’s left of the old city wall abuts the villa on its left side. 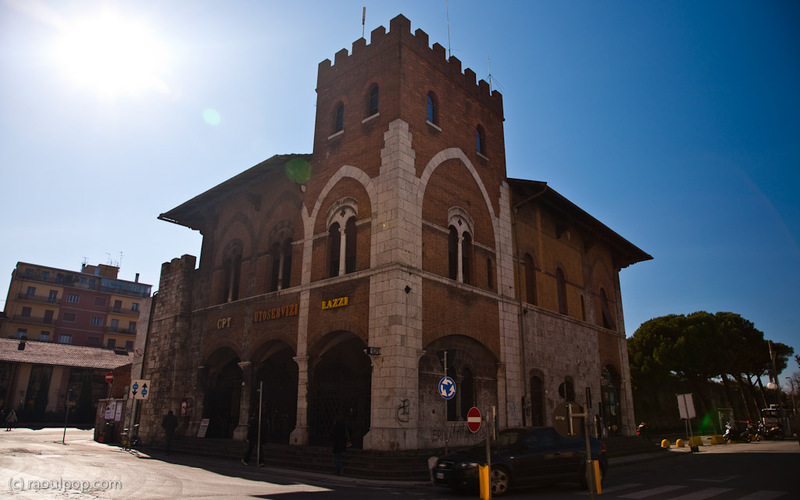 Transfer point for the CPT Autoservizi Lazzio. The villa itself was built to last, with plenty of attention to detail. Notice the wonderful ironwork protecting the windows, and the late Gothic columns that divide the window openings. Guess what I found on the other side of the old city wall? 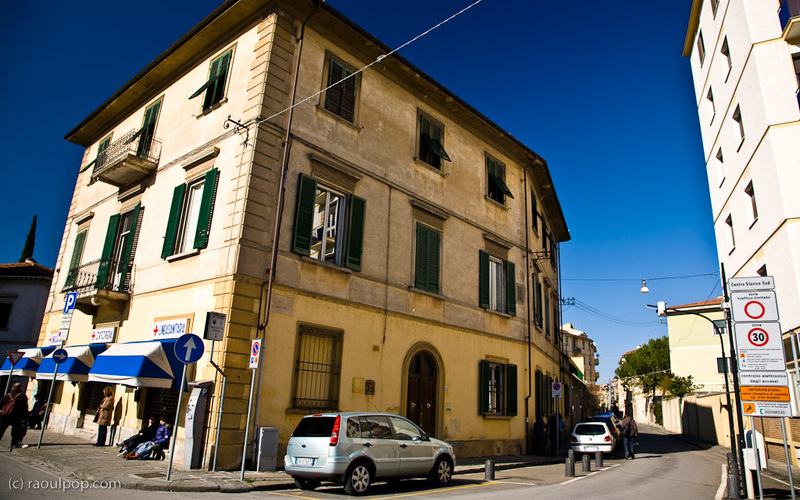 The headquarters for the Asociazione Radioamatori Italiani, Sezione di Pisa (Italian Amateur Radio Association, Pisa Club). Glad to see ham radio folks are still around. While Romania was under the clutches of communism, amateur radio was one of the very few ways people could communicate with foreigners. They used to build their own radio equipment, at risk, and try to get in touch with folks in Western Europe. Some would keep in touch with their families, who’d already fled the country, some would do it for camaraderie, and others to keep their hopes up by knowing they had a line to the free world. 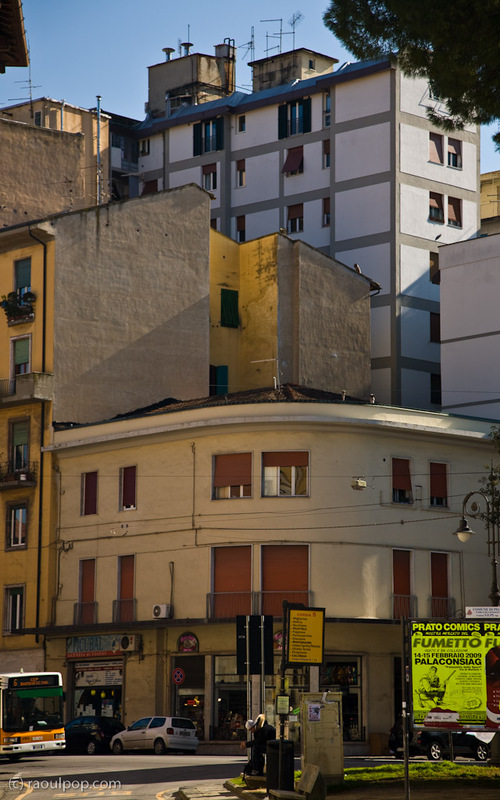 I liked the juxtaposition of these buildings and their rooflines. 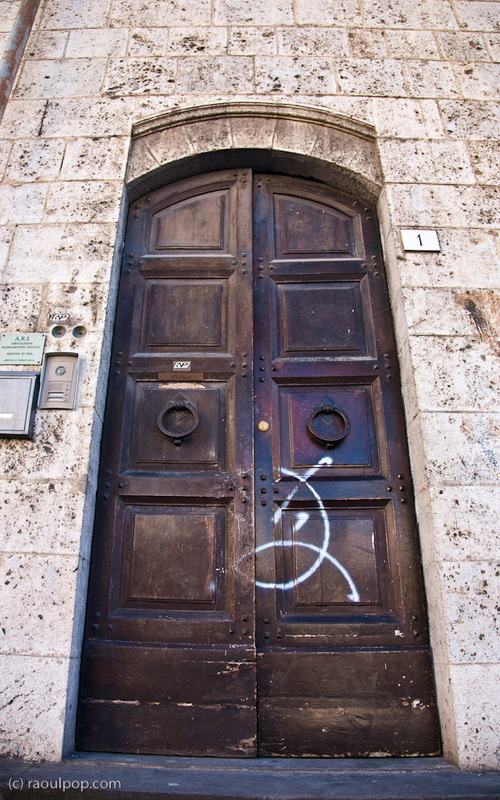 The sign in the photo below says “Area di atessa sicura”. I’m not exactly sure what it refers to: perhaps that’s a bus waiting area, or a place where you can wait in peace — for what, I don’t know. At any rate, if you’ll look up at the roofline, you’ll agree with me that it’s an unusual corner. I haven’t yet seen a broken roofline at the corner of a building. 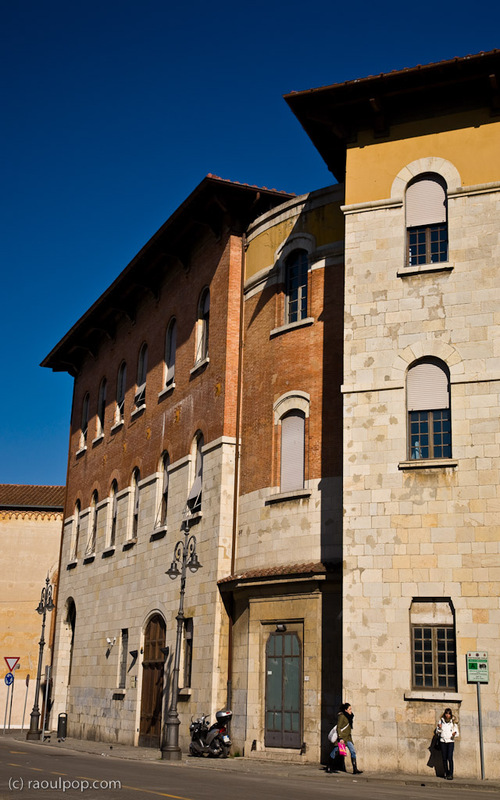 A building which housed, among other things, one of the restaurants in downtown Pisa. 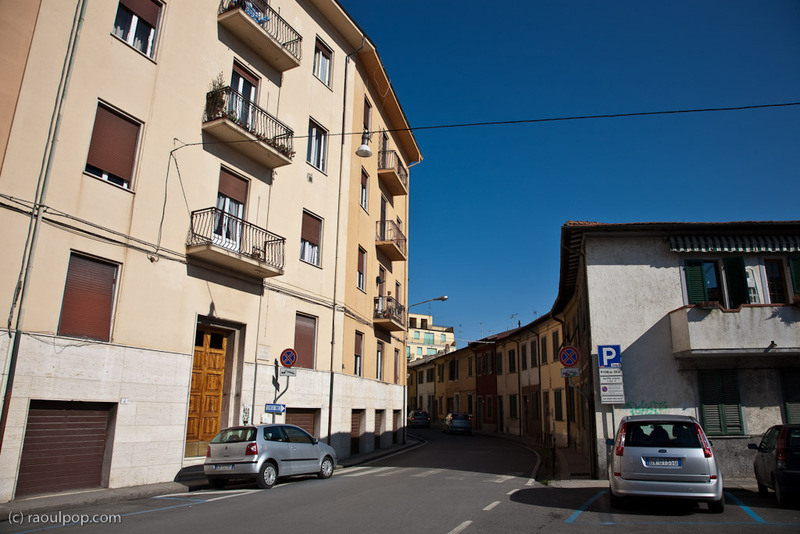 One of the side streets that branched off the main piazza and roundabout that can be seen in this photo. There’s a church that’s visible in the photo above. There’s a mural underneath the awning that covers the entrance. 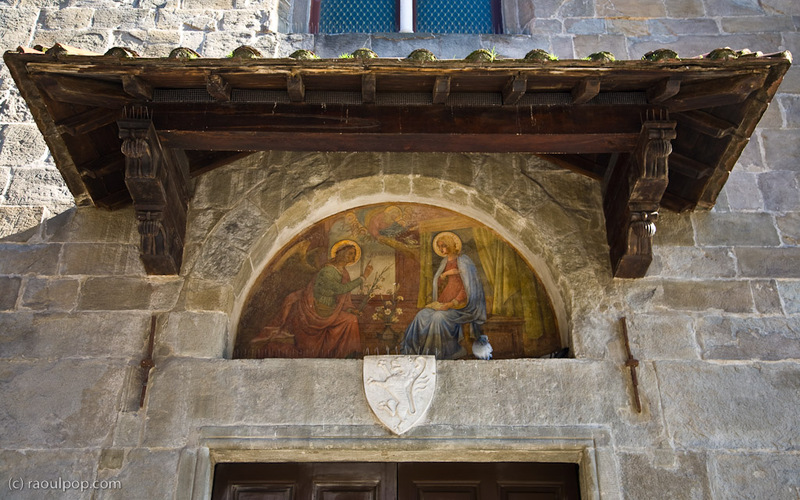 This is that mural, which depicts the annunciation, or the scene when the angel Gabriel tells Mary that she’s been chosen to bear the Son of God. I would have liked to go inside the church, but that was unfortunately not possible — it was locked. 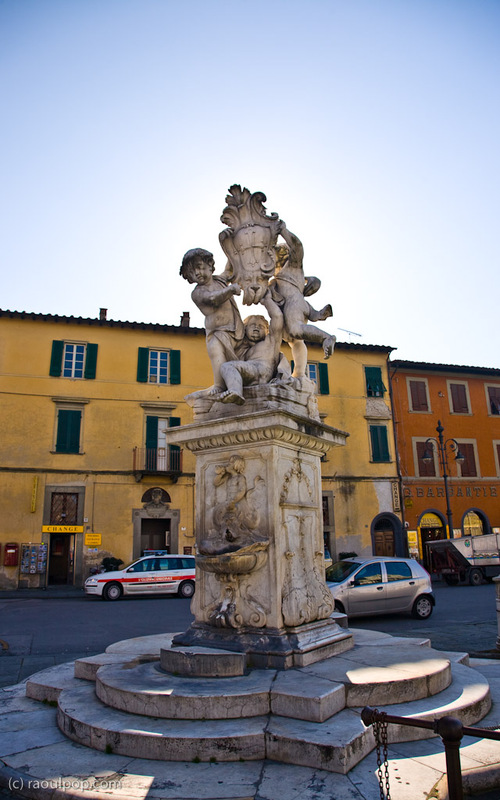 But enough about Pisa’s streets. 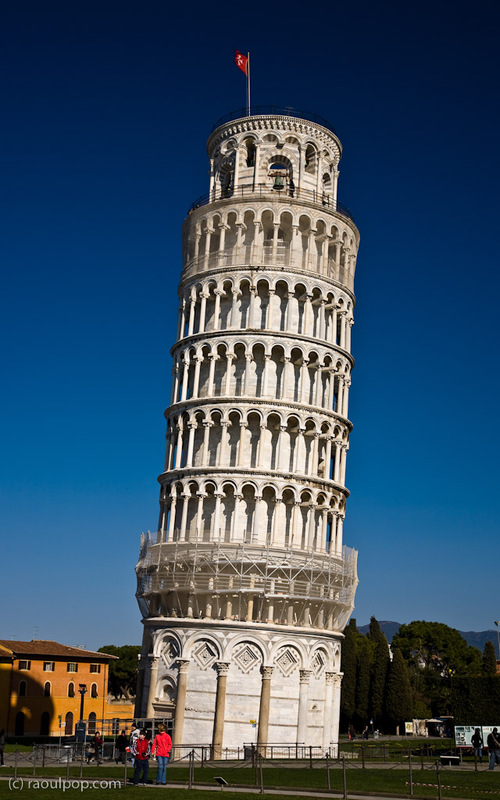 Let’s get to what everyone wants to see: the Leaning Tower of Pisa. 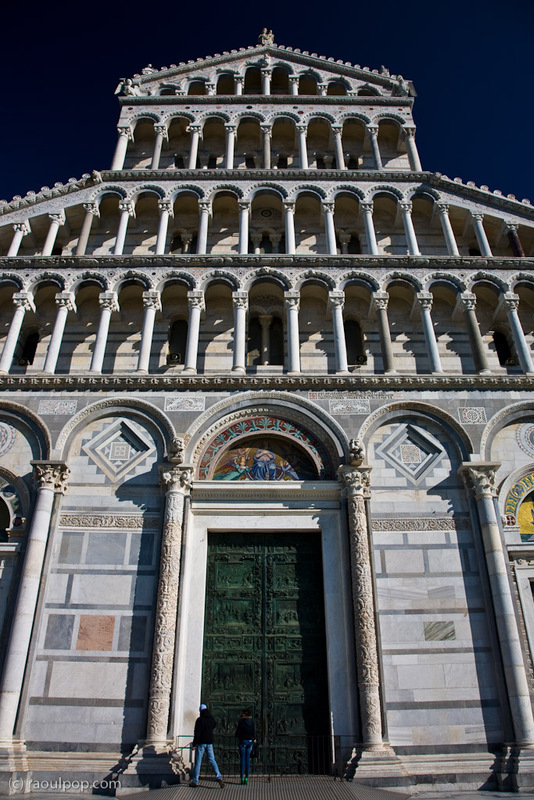 Here it is, as seen from the back entrance to the Piazza dei Miracoli. Here’s another view of the tower, from its back — an angle that’s seldom used, and that’s why you see no people in the foreground. Everyone goes to photograph the tower from the lawn of the Duomo, because that’s where they do all those silly tricks where they pinch the tower between their fingers, or pretend to push it with their hands and feet, or… well, you get the idea. Here’s a view of the Duomo from its back. 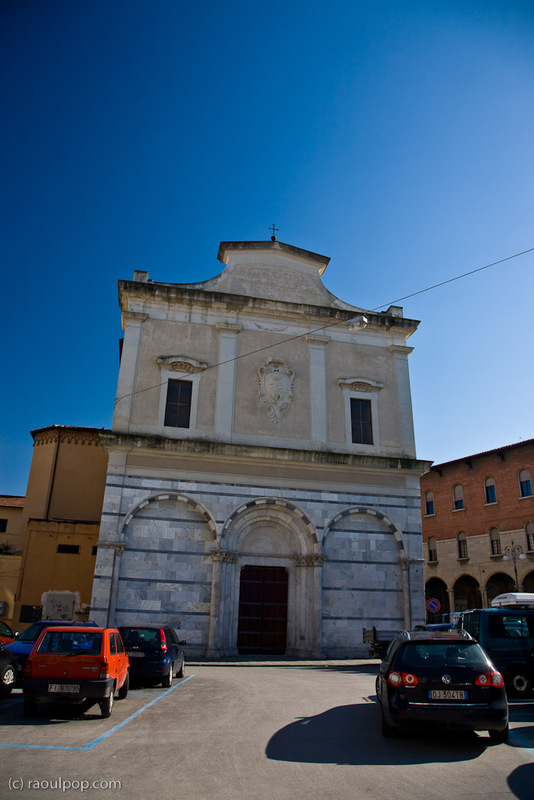 This is actually where the altar is located, so if you’re inside it, it’s the front, but such is the way cathedrals are. The back is the front is the back, depending on whether you’re inside or outside. These little guys are holding up some family crest — probably the folks who put up the most amount of money to have the place built. Note the smaller cherubim riding on top of something above the water spout. He looks like he’s peeing inside the bowl — a fairly common theme in these older water fountains. 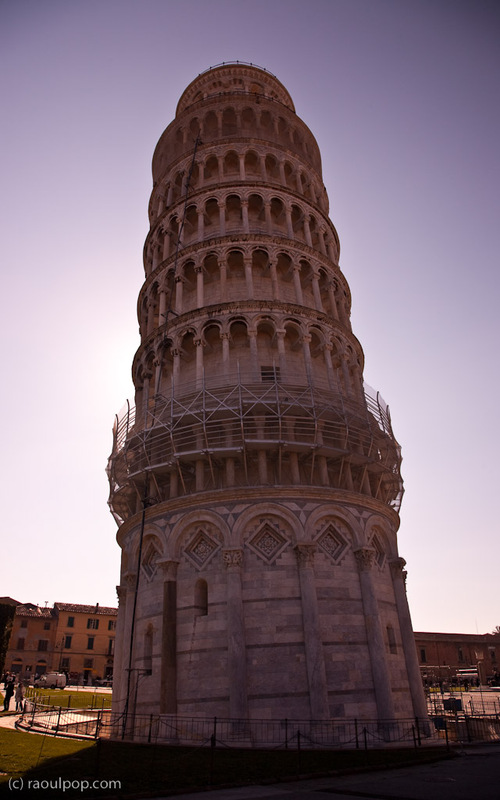 Here we go, this is the typical view of the leaning tower, the one that everyone brings back with them. And this is us in front of the tower, doing the typical tourist thing and smiling for the camera with the landmark behind us. As cheesy as I think it looks when I see others doing it, I have to admit that it’s nice to have these photos when I look back at the places I visited. By the way, my brother in law, Radu Anastase, took this photo. He’s a talented photographer who at 19 years of age has already had paid work published in Romanian magazines. 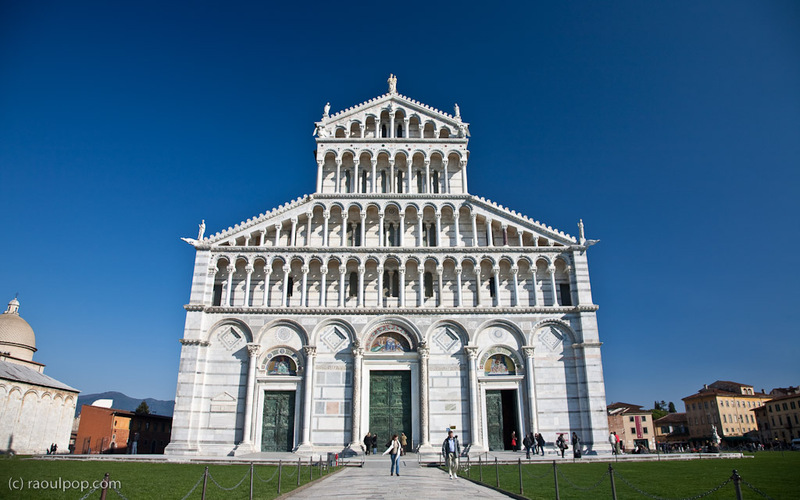 Here’s another view of the Duomo, from the nice, grassy lawn that covers most of the piazza. Shortly after taking this photo, a guard came and shooed everyone off the grass — apparently, they don’t want people trampling on it, which is silly. It’s practically a historical pastime to get on the grass and take photos of the tower. They might as well get over it. 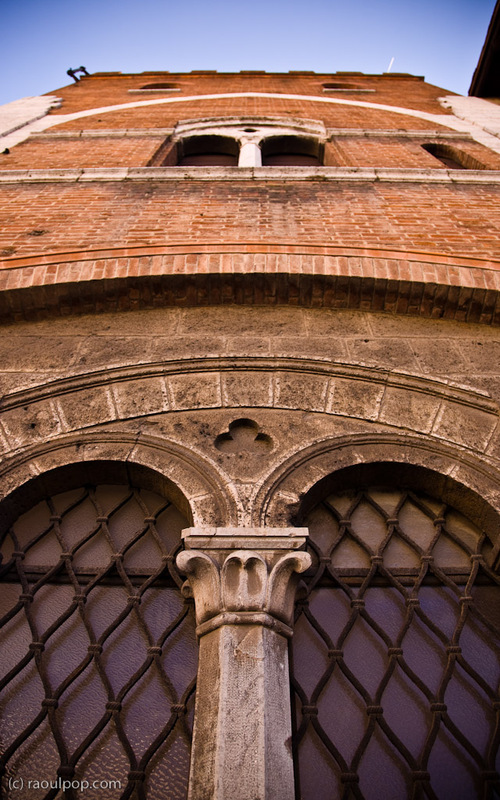 I like this shot of the tower peeking out from behind the Duomo, because it emphasizes the tilt in its vertical axis. I was impressed with the Baptistry, the round dome next to the Duomo. 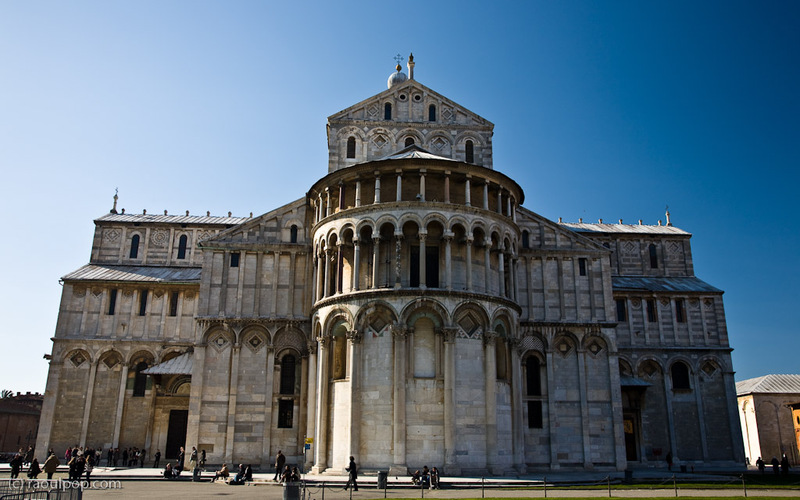 It’s older than the Duomo, and might even be a few centimetres taller than the Tower, according to Wikipedia. 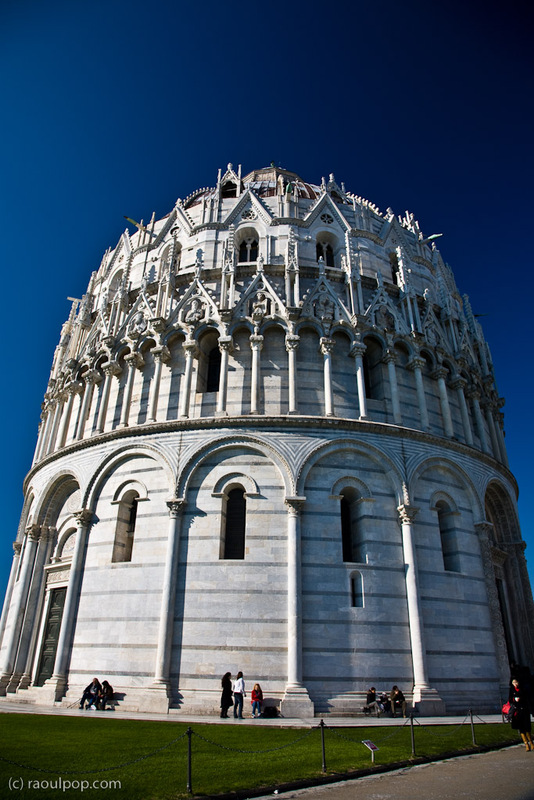 Here’s another view of the Baptistry, from its front entrance. The Duomo’s front is impressive indeed, with all those rows of repeating arches, held up by rows of Corinthian columns. Notice the bottom row of columns, which is engraved with intricate reliefs. Can you imagine the work that went into making them? The inside was even more impressive. Light streamed in through the windows in the upper level, reflected off the richly adorned ceiling and filtered down to the marble floor. 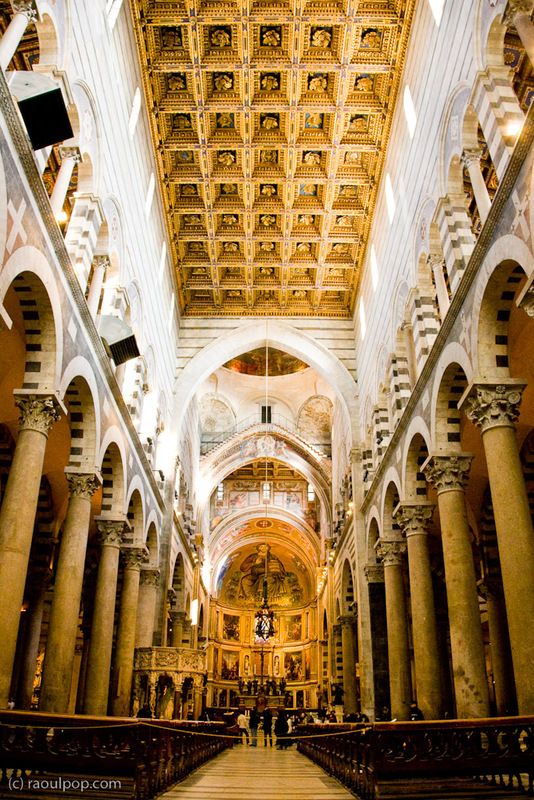 This is a panoramic photograph which includes the main altar and main ceiling mural of the Duomo. You can’t appreciate it fully here, but its original resolution is 2835 x 6852, and it’s made up of three individual photographs. I chose to process this photograph differently because I thought the subject matter fit this finish better. 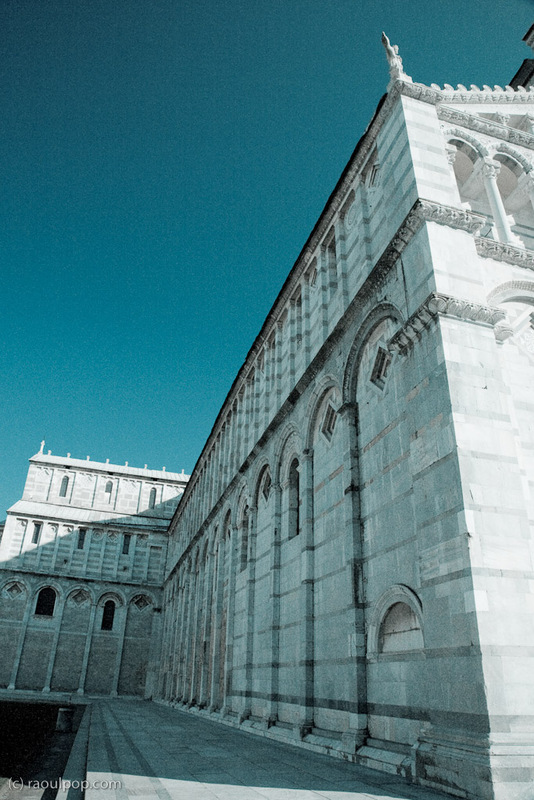 It’s one of the side walls of the Duomo, the one that faces the Camposanto. About the same time that I took this photo, Radu (my brother-in-law), took this photo of Ligia. She’s his older sister and my lovely wife, just in case you’re trying to figure out the relationship. 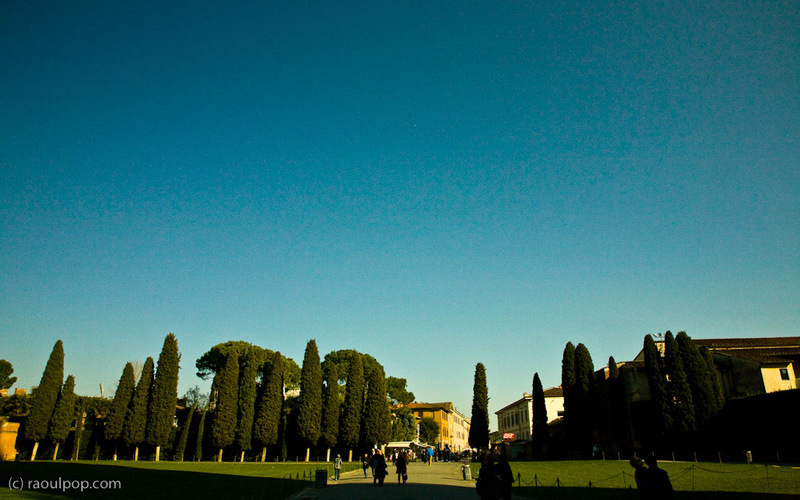 She was walking toward us from the Camposanto. The shadows were getting longer. It was time for us to leave. We needed to arrive in Florence by nightfall. We headed out the same way we came in, through the back entrance, which was less crowded than the alternative. What you see below is a typical Tuscan landscape. They have those wonderful conifers which grow in the shape of popsicles, and that specific architecture that defines the region. All this photo needs is a few gentle rolling hills and some distance between me and the villas, and it’d be perfect. 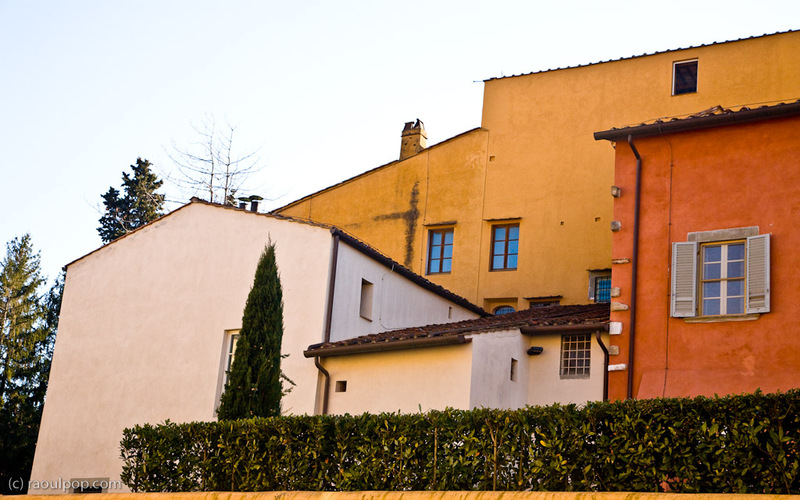 I saw this Tuscan villa on the way to our car, which was parked just down the street from here. I love this kind of architecture. 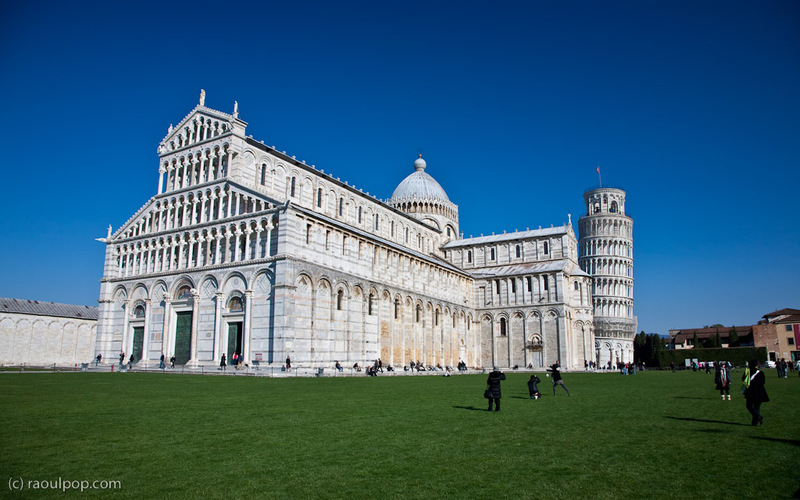 I’d have liked to have seen more of Pisa, but when we only had a week at our disposal and our route was already mapped out, I had to stick to the schedule. It was time to leave and get on the highway. 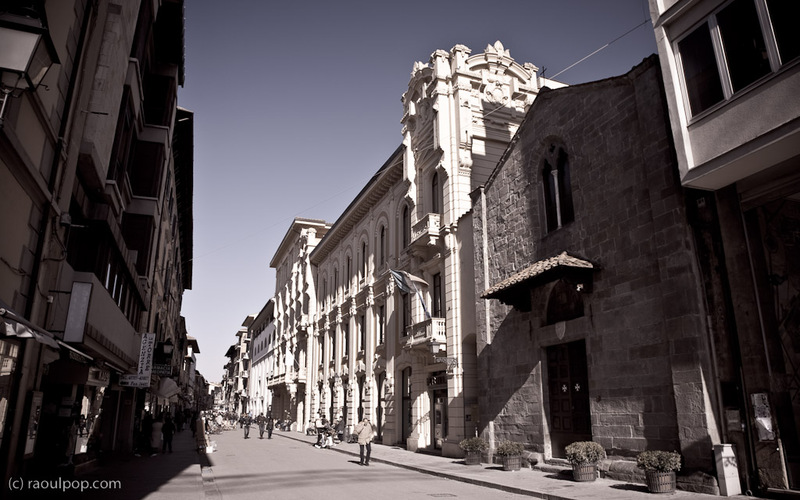 Firenze, the next stop on our road trip, awaited. 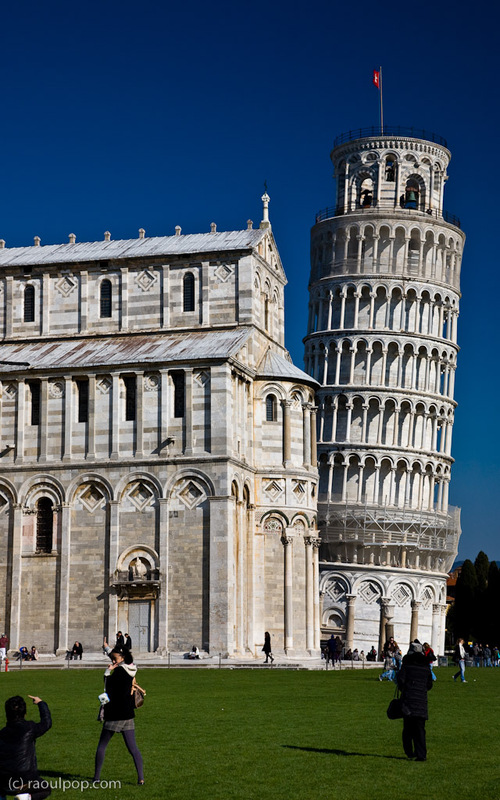 All of these photographs (and more) are available in larger sizes in the Pisa album in my photo catalog. Frumos. Imi plac in mod special imaginile aeriene. Thanks, Valarie and Ian! 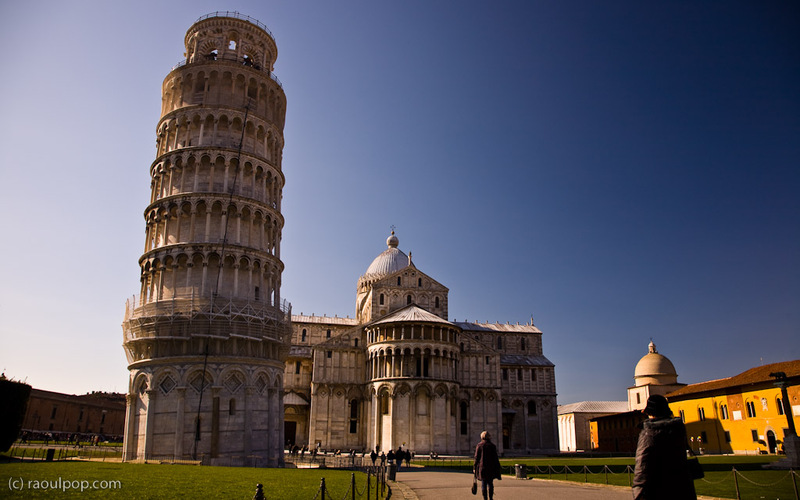 I do wish I could have stayed a little longer in Pisa, or for that matter, in any of the cities I visited during my trip. Enjoyed your article. I think the colours of the buildings are wonderful. Your panoramic is incredible. The light is perfect. I hope I cancapture this in a way that does the place justice as your photo has. Simply stunning photography! I’ve never been to Italy but I would very much like to go there! I never saw so prekraseyh places than on your photos!